Rooftop solar on its own is already affordable enough to be a smart choice for virtually any Australian home with an unshaded roof and some daytime electricity usage. This is true even in the absence of generous, state-backed solar feed-in tariffs and the (slight) reduction of the up-front incentive for solar available through the federal Renewable Energy Target. In fact, Aussie homes have been installing solar at a steady pace long after the most generous incentive programs were closed to new applicants. Solar system installation prices have been steady for the past few years- we know because we keep track of them in our Solar PV Price Index. No sudden reductions (or increases) are likely to be on the horizon; the market has stabilised after the initial turmoil of its first few years. Lots of things have changed in recent years with regard to solar power for homes. The business case for going solar – the investment-worthiness of solar panels – has quickly progressed through roughly three stages since the solar panel boom began in Australia in around 2008. At this point, it seems fairly clear that residential solar power is here to stay in Australia. Close to 2 million homes already have a solar PV system, and there is now more than one panel installed per human being in the country. Virtually all industry analysts and investment houses – both within and outside Australia – are predicting that solar (and battery storage) are the future. The strongest evidence for the permanence of solar as a household fixture in Australia is the solar system price trends witnessed over the past several years. The chart below offers a glimpse into how average prices have changed since 2012. Systems cost about 40% less to install in January 2018 than they did in August 2012, according to the data that we’ve been keeping track of. Average solar installation prices – indexed average and by capital city (excl Darwin). Click to enlarge. You can also get pricing specific to your home and location by requesting a Solar Quote Comparison by filling out the form to the right of this page. Several years ago, it was common for most homes to install 1kW, 1.5kW and 2kW solar systems. As prices have come down, however, the average solar system size has increased – and these days, 3kW, 4kW, 5kW and even 10kW solar systems are not uncommon. In fact, the larger system sizes almost always offer better value for money than smaller ones. Not sure which size system is best for your home’s needs? Check out our Quick Guide to Solar System Sizing or try Solar PV System Sizing Estimator Tool. Generally speaking, it’s important for homes to choose a solar system sized appropriately for their situation – meaning that they can use at least 30% of the energy it produces directly. However, if they can use even more (e.g. 50%), then the business case gets even better. According to our data, with a self-consumption rate of 30%, payback times for 5kW solar systems are under 6 years on average, nationally; in Adelaide, Brisbane, Darwin, Perth and Sydney they’re easily under six years, as per the table below. The internal rate of return (IRR – a metric for comparing investments similar to ROI but more comprehensive) for a solar system in each city is easily over 10% – on average 18% but as high as 24% in Adelaide. Note that the table below uses average system prices to be conservative. Solar system owners may see even shorter payback periods and better IRR if they find systems for less without compromising quality, or if they manage to increase their self-consumption rates above 30%. *Outputs in table assume average electricity consumption of 25kWh/day, north-facing panel array tilted at 30 degree pitch, electricity inflation rate of 2.5% per annum and discount rate of 5%. Note that we haven’t examined the case for going solar on a time of use tariff type, but that results are generally similar. **Based on figures from the most competitive plans on EnergyMadeEasy and other relevant websites. Did you know that most Australians have a choice of electricity provider? Residents of all states/territories besides WA and the Northern Territory can shop around for better rates for free using sites like EnergyMadeEasy.gov.au and Wattever.com.au. In 2018, solar power systems remain affordable and attractive, especially in light of the plague of high electricity prices. Solar feed-in rates may be not be spectacular, but with system prices as low as they are it’s not difficult to see favourable returns from putting solar on your roof, particularly if you shop around and manage to find a good deal. Furthermore, making efforts to increase your rate of direct solar energy consumption (e.g. with a home energy management system) will also help to maximise returns. In places where low system installation prices collide with high electricity prices, solar makes spectacularly good sense without much effort. 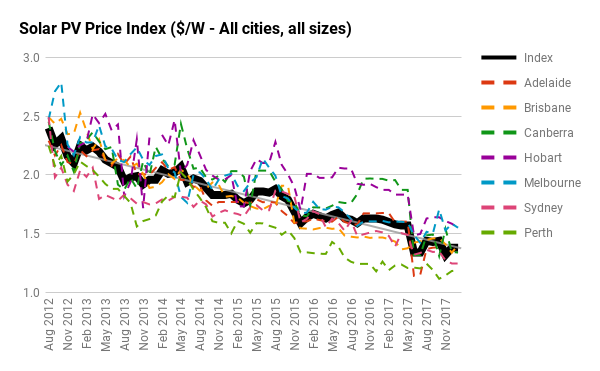 But even in cities with higher average system prices put payback periods over 7 years in our examples, it doesn’t take much to improve the financial case. We recommend shopping around for the best deal possible and ensure that you can use the solar energy that your system will produce. What if you sent all of your solar energy into the grid for feed-in credits? Which retailer is offering the best feed-in tariff? I am with Simply Energy and get a 30% discount if I pay my bill on time. this lowers buying electricity from the provider to 21c. My electricity provider has just increased my feed in tariff to 17c from 6.8c I have a 5kw solar system on the Northern side of roof already and am seriously thinking of getting a further 5kw on the western side of the roof in the hope of eliminating my bills completely and possibly going into credit so that the gas bill is paid. What do you think of my idea? Interesting thinking – and you wouldn’t be the first to have this idea. The first thing you should do is work out the numbers and see if you could theoretically cover your bills with that much solar. Secondly, you’ll want to look into what the upper limit is on solar system sizes for solar feed-in tariff eligibility – in some network areas / states, solar systems over a certain capacity are not allowed to export excess solar to the grid, or if they are their export amount must be limited. My understanding is that this is only possible if a digital smart meter is installed, ( ie. interval reading ) however, here in SA we only have basic solar import/export meters. When I contacted SA Power Networks, they advised me that they have no plans to upgrade these to smart meters at this stage. Consequently, all generation from the solar array is exported to the grid at about 8 cents /kWh now that Govt. feed-in tariffs have expired, & imported at approximately 32 cents /kWh !! I agree that it would be great if we were able to off-set the power used during daylight hours on a 1 for 1 basis instead of 8 for 32 !! Do you have any idea when SA will convert to smart meters as Vic ( & perhaps other eastern States ) have done ?? Four members of my family are keen to install solar but are hesitant at the moment because of the current situation. With respect, I must question the table above which suggests a payback period of approx. 3 to 4 years for a 3kW solar PV system in Adelaide based on self-consumption, unless smart (interval reading) meters are being installed by an electricity retailer that I am not aware of ?? Thanks for commenting – and for reading! I think you may be confusing the general concept of ‘net metering’/’net billing’ with smart meters and interval meters. A net metering setup is simply one in which the solar energy flows first into the home, with only the excess, unused solar energy going into the grid. The opposite is a gross metering setup, in which all of the solar energy goes directly into the grid, with no opportunity for self consumption to happen. NSW homes on the (now defunct) Solar Bonus Scheme were all hooked up on gross meters, but in South Australia the default metering for grid-connected solar systems has always been net. Whether a metering system is gross or net has nothing to do with whether a meter is a ‘smart’/digital or analog meter. In fact, most of the solar homes in SA are hooked up on net setups with analog meters. The main advantage of a smart meter is not that it allows for net metering (again – the two are unrelated), but rather that it allows the electricity retailer to read your electricity consumption & solar export in detail – and compose your bill without having to send out a meter reader. No one in their right mind would be installing solar these days if their only option was a gross meter – and in fact many network companies (the local grid operators) discourage solar export to the grid if anything! In summary: Check with your electricity retailer or SA Power Networks about what sort of meter you have in place (if you already have solar), and ask what procedures will be necessary (if any) to ensure a net metering setup (if you’re planning on getting solar). In neither situation is a digital smart meter necessary from a solar net metering perspective, although the state/network company/retailer may require a digital meter for other reasons (I’m not sure what the state policy is at the moment, unfortunately). Hope this helps clear things up a bit!